I met with Matthew Broussard, Billy Trim and Jackie Ellison before the beard competition to get quick interviews about their bearded lifestyles. Once I was at the tournament, I used a field microphone to “eavesdrop” on conversations and interview participants in the tournament. 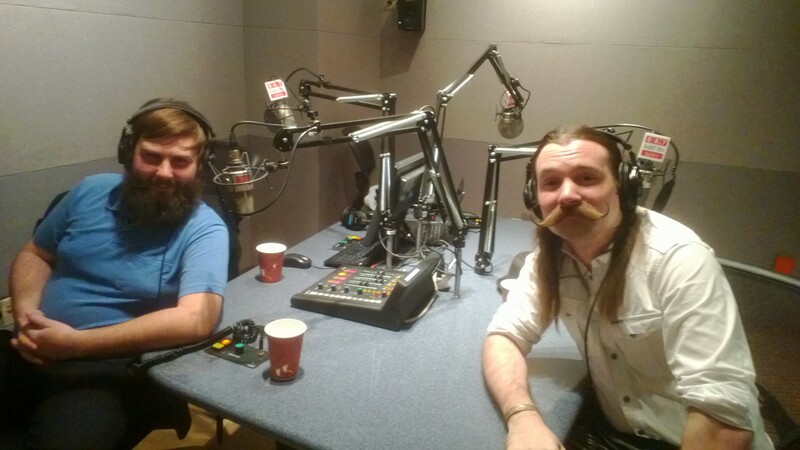 Billy Trim (L) and Jackie Lynn Ellison (R) show off their facial hair in the KUHF studio. Since 2004, the month of November has been referred to as “No-Shave November” or Movember. The concept is simple: don’t shave your facial hair for 30 days to raise awareness for men’s health issues such as prostate or testicular cancer. But there is a group in Houston that advocates growing a beard year-round, not just for a month: The Houston Facial Hair Club. Yes, Houston is truly a city that has everything, including a group of facial hair aficionados. Usually we just get together and just hang out. That’s what the club was founded on, people who like facial hair, they just come out and talk and share some stories about your daily life and talk about what’s coming up in Houston, events and stuff like that. It’s the end of November – or – sorry – Movember, and I’m at the annual Movember Beard & Moustache Competition. There are enough bearded men here to form a dozen ZZ Top tribute bands. Despite being a beard competition, it is for a good cause and Broussard hopes that events like these can help break down social stigmas against big, bushy beards. Unfortunately, it gives off the vibe of maybe they don’t have everything together. Back in the day, well distinguished men and generals, they all had amazing facial hair. And now, to tell you the truth, the only people you really see with really big beards and stuff are people without a job, so they didn’t have a reason to shave or homeless people, they have really big beards. I really don’t like that some business make their employees shave. I understand they want them to look nice and orderly, but who’s to say that can’t include a beard? Broussard, who has been growing his beard out for over a year, notes people in other cities seem to more immediately accept the look. Say if I go to Austin, I have some friends there and when I go and visit no one really – I get the occasional ‘hey nice beard’ or whatever. I get a lot more shocked faces. So it’s not as big here as it is in Austin, but we’re hoping to change that. Bring the beard here to Houston. Some of the competitors at the Movember Competition say that confidence is the key to wearing facial hair. You know, you gotta own it, I asked for it. That’s Jackie Lynn Ellison. He’s been growing his mustache out for three years. His mustache extends past his lips and curls upward, not unlike Snidely Whiplash. Each hair is easily past three inches and makes Wilford Brimley look prepubescent. He has taken part in beard competitions all over the world. Ellison’s co-worker, Billy Trim, is another facial hair enthusiast. Yes, his name is Trim. My catchphrase right now is that my beard is always Trim. I definitely do a lot of research to take care of it. Y’know I use a beard oil to keep the skin hydrated and it keeps the hair stronger, a lot easier to comb. I recently got a boar bristle brush because I’m that kind of nerd. Y’know I read up which brush is better, a horn comb is better. The beard oil is great, it smells great, it does a lot of great things, but I try not to have any superstition about anything. I do the bare minimum to make it look fabulous. But how do you judge a beard competition? Lauren Jacobs is a member of the Houston Facial Hair Club. Anyone can join. It’s a club for beard wearers and lovers alike. Jacobs was a judge at this year’s Movember Competition. She says there are a LOT of factors. Actually, there’s a lot of studying involved. I have to know a lot about beards and mustaches, you have to know what it takes to grow a full beard. You also have to know about the luster, and width versus how long it takes to grow something like that. Before the competition began, clusters started to form. The men who work hard to style their beards would stand away from the unkempt, homeless looking beards. The mustachioed men would admire each other’s waxing and curling techniques. There were even some local celebrities, so to speak. Ryan Perry was the 1st place champion last year. Kinda defending my title. I won last time. How long have you been growing that out? This is six months. I’ve been growing it since may. After the last one, I chopped it off and started growing it back out in May again because I couldn’t get rid of the urge to grow it back out again. Not really nervous. I’m just, uh, I think it’s gonna be a good time and a lot of fun. What kind I do? I’m here. I’m gonna stand on stage. That’s about it. Did you do anything to prepare for the competition today? Yeah, you know I put in my beard oil and I brushed it and I made it smell all nice and look all good so, that was my preparation. Jackie Lynn Ellison deals with pre-show jitters in his own way. Sometimes I’ll think about great men of the world and of time and try to get in the champion mentality because, you know, to win you have to believe it. You gotta roll through the whole shtick. So, I like Arnold Schwarzenegger and Leonardo da Vinci and just incredible guys. After presenting their facial hair to the judges, competitors would stand around and swap advice on beard care, share anecdotes about accidentally lighting their beards on fire, and proclaim a universal hatred for the show Duck Dynasty, a popular reality show about bearded men who make duck calls. Oh god, don’t even get me started dude. I mean their beards are gross. It works for them and in a way it’s representative but it shouldn’t be. But soon, it was time for the judges to make their decision. To my left is Eric Hof and he came in second place. Give him a round of applause, that is a fantastic mustache. That leaves us with Jackie Lynn Ellison here and we have a winner here folks, we have a winner, first place! After receiving a free case of beard wax, Ellison gave his victory speech. I feel great, y’know? It’s always a blast to win anything, especially something you’ve been aspiring to be successful at. At the end of the night, it was time to announce the winner of the one-to-six inch category. Perry and Trim were tied for first. We have a tie for first place. So how do we break a tie? That’s an interesting question. And the answer is all of you. So, let’s hear it for Billy Trim! Alright, alright, one heck of a crowd here. I think we have ourselves a winner! Wow, I’m gonna say, that’s Ryan Perry! Ryan Perry, congratulations! Despite not winning, Trim was in high spirits following the announcement. I feel really good about it. It just, it feels good to place. It feels good to at least be tethered to the top person. I may not be the top person but it was decided between us and that was great. I’m at least 2nd place. I’m 1 ½ place. Both Trim and Ellison plan to continue participating in facial hair competitions across the globe, fighting their fight for beard acceptance. For Houston Matters, I’m Conner Clifton.